Annie Bissett is a mostly self-taught artist who has been working primarily with Japanese-style woodblock prints (moku hanga) since 2005, when she studied briefly with New Hampshire woodblock artist Matt Brown. Annie’s print work builds on her 25+ year career as a freelance digital illustrator, serving a national clientele that has included Time-Life Publications, National Geographic Society, American Express, and the Wall Street Journal. Her woodblock prints have been exhibited in a number of printmaking venues including Boston Printmakers Biennial, Los Angeles Printmaking Society, the Robert Blackburn Printmaking Workshop, the Print Center in Philadelphia, IPCNY, and the International Mokuhanga Conference in Kyoto Japan. 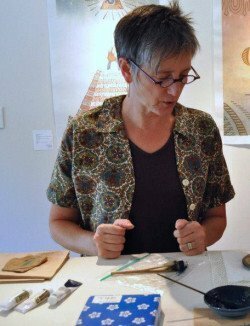 She has been an instructor at Zea Mays Printmaking Studio since 2009 and also travels to conduct workshops at studios and institutions throughout the U.S.
My printmaking practice is focused on the Japanese method of woodblock printing, also called moku hanga. This technique is an elegant and simple form of relief printing that is completely non-toxic and ideal for use in a home studio. It is also easily combined with other printmaking techniques. Moku hanga is an easy technique to begin to use but a difficult technique to master. To get the most out of individual instruction, I would recommend an introductory workshop followed by a period of practice. Once you’ve gotten some practice, a session of individualized instruction can be very valuable for troubleshooting particular problems or questions and taking your practice to the next level. I also enjoy working with other artists around self-promotion, something I’ve had to address in order to establish and maintain my career as a freelance commercial artist. If you feel you’re at a point where you’d like to explore ways of getting your work seen more widely, we can work on things like setting up a web site, using social media, finding opportunities for funding or showing, and using online sales outlets.